The upcoming NBA offseason promises to be a doozy. Among the many pending high-profile storylines is the fate of the Los Angeles Lakers. Will Magic Johnson land one or more of the summer’s free-agent whales to play alongside LeBron James, and will James do his part to lure them? James prides himself as a master recruiter, able to attract top talent offering the promise of playing alongside one of the game’s all-time greats to compete for championships. But if Brian Windhorst is to be believed, James’ recruiting prowess may not be what it used to be. He can’t even get players to sign up to alongside him for “Space Jam 2,” according to the ESPN reporter. Windhorst told Rachel Nichols on “The Jump” Thursday that James has struggled to close the deal with “top guys” to join him on set. So that doesn’t bode well. If James can’t convince guys to play a movie role in his shadow, can he convince them to do so on the basketball court? Of course luring players for a movie and a basketball team are two completely different tasks. But, as James himself has said, this offseason is critical for his tenure with the Lakers. If the Lakers don’t land at least one of the summer’s prime free agents that include Kevin Durant, Kawhi Leonard, Kyrie Irving and Klay Thompson, it’s going to be difficult to salvage what’s expected to be the last stop of the 34-year-old’s career. 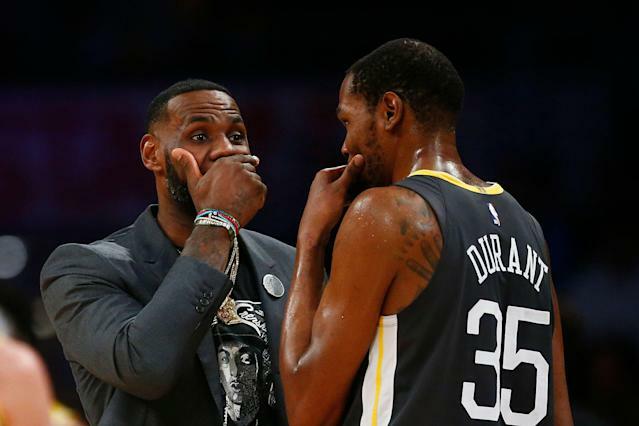 With rumors pointing Durant to New York and painting Leonard as reticent to play a secondary role to James, LeBron may be facing similar recruiting challenges on the court as Windhorst reports exist on set. If that’s the case, a trying season in Los Angeles could extended into an even more difficult offseason.